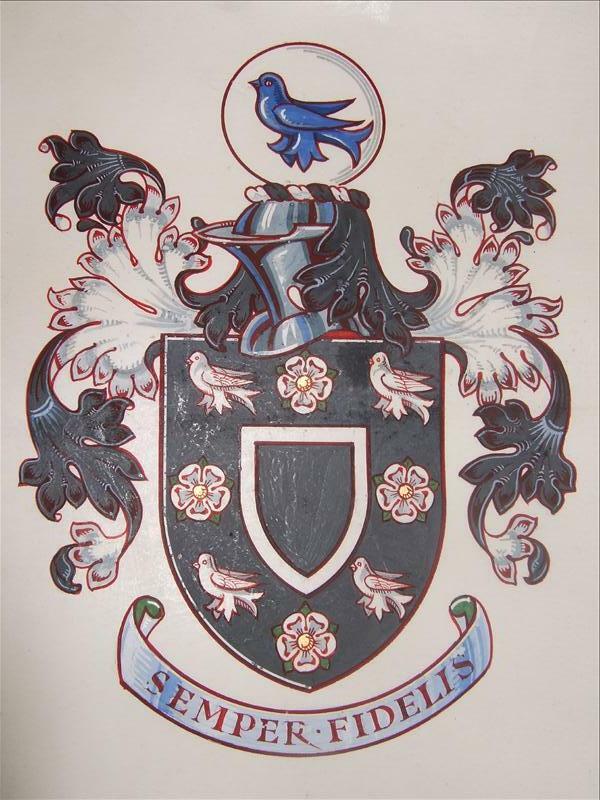 “The Rigbye’s estate included a share in Wrightington Manor, and properties in Parbold and Wrightington, as well as other properties in Windle, Rainford and Euxton. There are other early deeds in this collection which relate to lands in Wigan, Eccleston, Heskin and elsewhere, but these properties were not part of the Harrock estate in 1775. The Harrock estate descended in the male line of the Rigbye family until 1775. 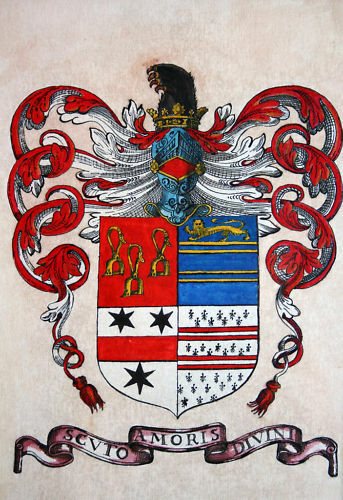 The head of the family always bore the name of Nicholas, until the last Nicholas died without heirs in 1754 and the estate passed to his brother Thomas, who also died without heirs in 1775. 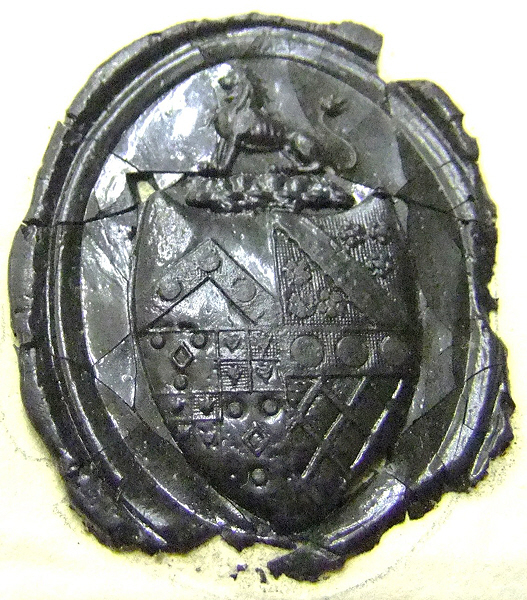 By his will (DDX 877 4/1(1)), Thomas Rigbye devised his estate to his sister Eleanor for life, and then to his nephew, the Rev. John Baldwin, rector of North Meols, who was the son of the Rev. Thomas Baldwin of Leyland by Thomas Rigbye’s sister Anne. 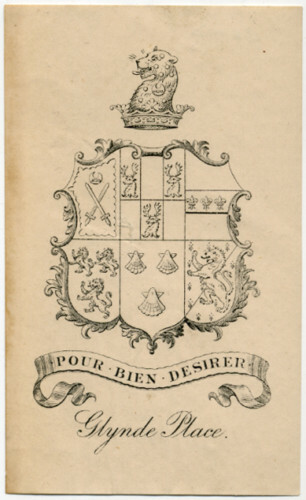 John Baldwin succeeded in 1787, took the name and arms of Rigbye, and resided at Harrock Hall. At his death, in 1793, he left his Cheshire estates to his eldest son Thomas and the Harrock estate to his third son, the Rev. Rigbye Baldwin who then became the Rev. Rigbye Rigbye. 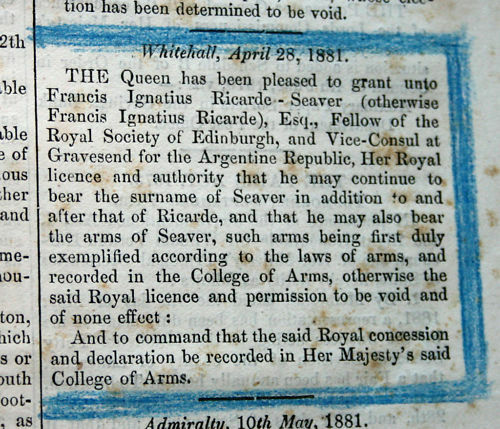 In 1829, the latter was succeeded by his eldest son, Rigbye Baldwin Rigbye. 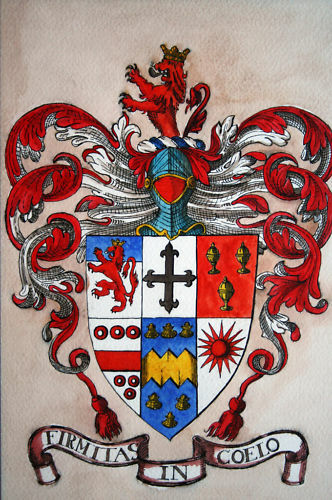 When the Rev John Rigbye (formerly Baldwin) died it required a second Royal Licence for his son Rigbye Baldwin to take the Name and Arms of Rigbye to become Rigbye Rigbye (d.1827). Rigby late Baldwin, of co. Lanc.,  Vol. XVI, fol.297. Rigby late Baldwin, of co. Lanc.,  Vol. XIX, fol.264. 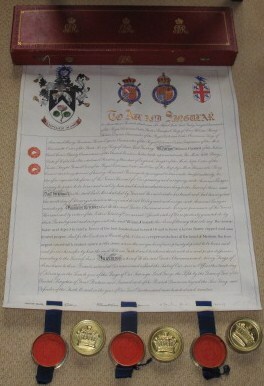 The second RL was also signed by Isaac Heard, Garter and George Harrison, Norroy. 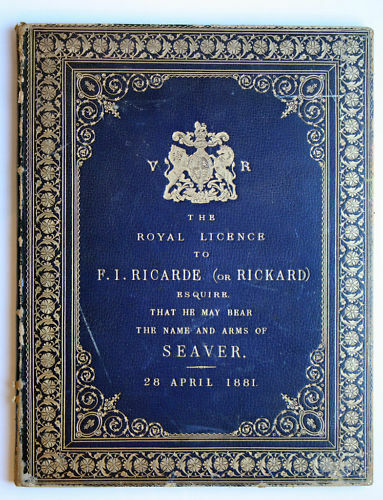 It was dated 16th June 1896 and it recently sold on eBay for £310. 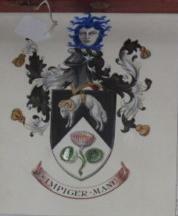 In November 2010 the Royal Licence for Henry Harwarden Gillibrand to take the Name and Arms of Fazakerley was sold on eBay. 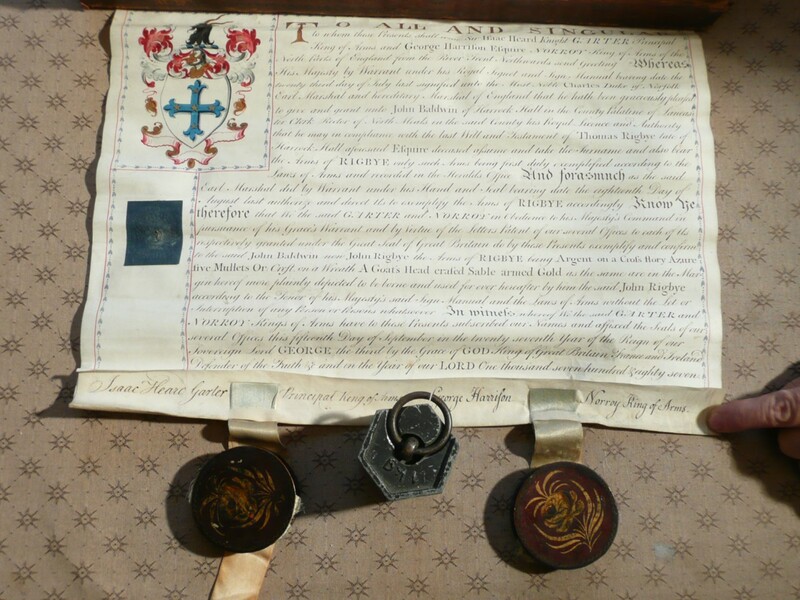 The licence is dated 4th August 1814 and was signed by Isaac Heard, Garter and Ralph Bigland, Norroy Kings of Arms. 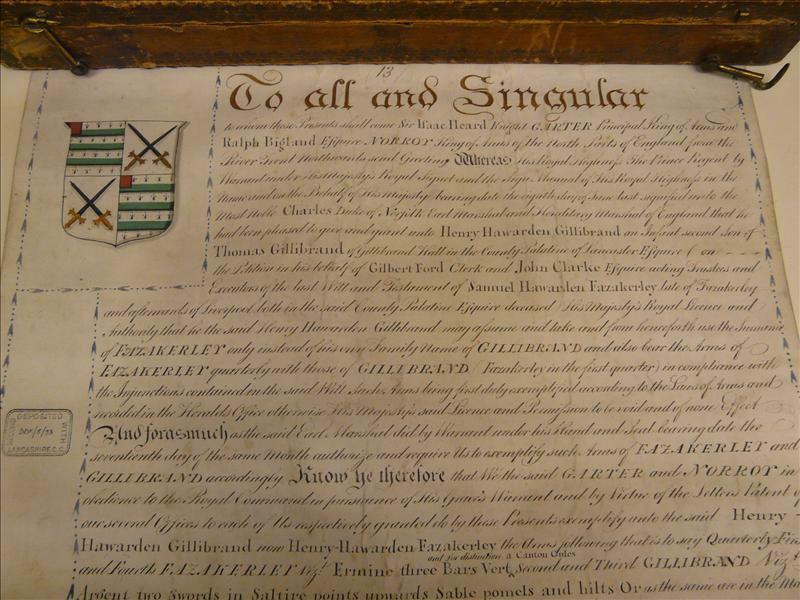 ..had been pleased to give and grant unto Henry Harwarden Gillibrand an infant second son of Thomas Gillibrand of Gillibrand Hall in the county Palatine of Lancaster Esquire on the petition in his behalf of Gilbert Ford clerk and John Clarke Esquire acting trustees and executors of the last will and testament of Samuel Harwarden Fazakerley late Fazakerley and afterwards Liverpool both in the said county Palatine Esquire deceased His Majesty’s Royal Licence and Authority that the said Henry Harwarden Gillibrand may assume and take and from henceforth use the surname of Fazakerley only instead of his own family name of Gillibrand and also bear the Arms of Fazakerley quarterly with those of Gillibrand Fazakerley in the first quarter in compliance with the injunction contained in the said will such Arms being first duly exemplified according to the Laws of Arms and recorded in the Heralds Office otherwise His Majesty’s said Licence and Permission to be void and of none effect. 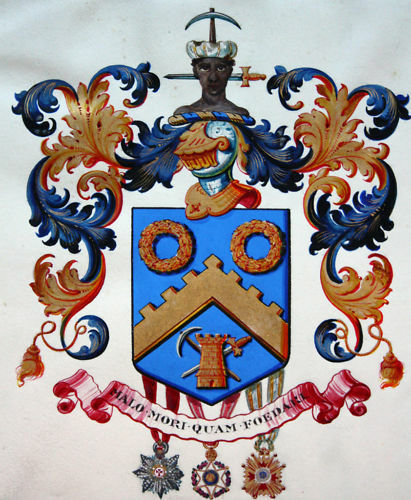 And forasmuch as the said Earl Marshall did by Warrant under his hand and seal bearing date the seventeenth day of the same month authorize and require us to exemplify such Arms of Fazakerley and Gillibrand accordingly. Quarterly first and fourth Fazakerley viz Emine three bars Vert and for distinction a canton Gules second and third Gillibrand viz Argent two swords in saltire points upwards Sable pomels and hilts Or. 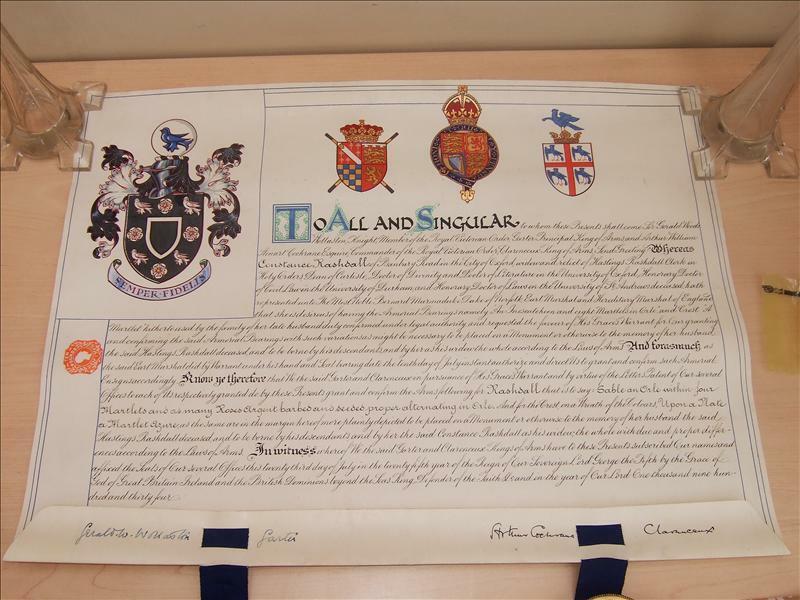 Interestingly there is no record of the Crest in the document nor in the emblazon. 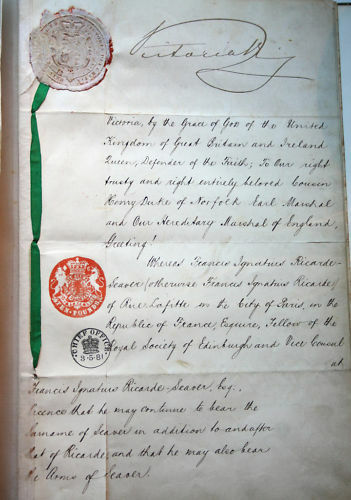 The document sold for £210. 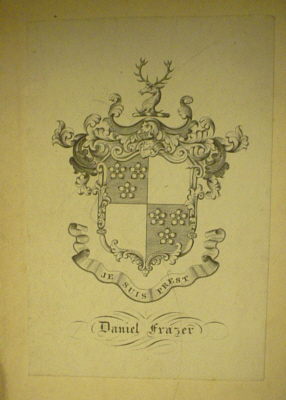 Another heraldic treat on eBay. 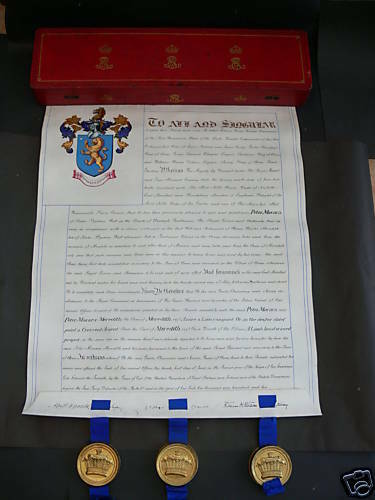 The Letters Patent for the Rev John Baldwin of Harrock Hall granting authority for him to “assume and take the surname and bear the Arms of Rigbye only” in compliance with the Will of Thomas Rigbye late of Harrock Hall. 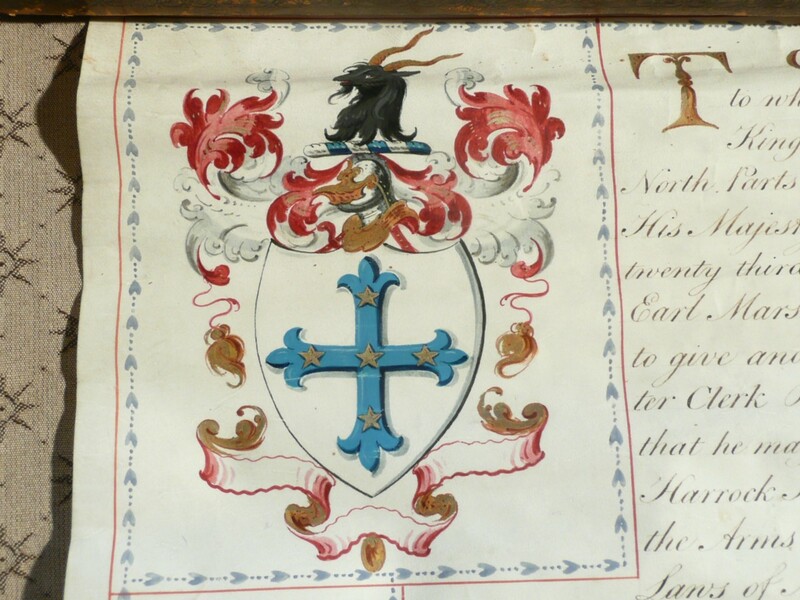 It is dated 15th September 1787 and signed by Isaac Heard, Garter and George Harrison, Norroy. 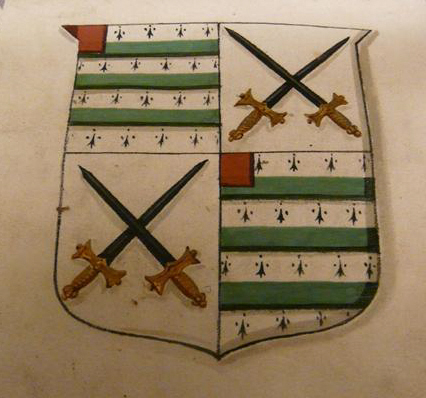 Arms: Argent on a cross flory Azure five mullets Or. Crest: On a wreath a goat’s head erased Sable armed gold. Photographs courtesy of the vendor, Lee Burgess (diggerlee). 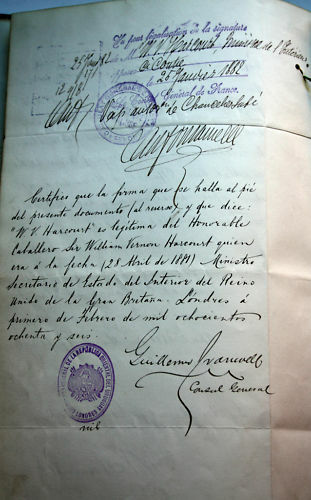 A Royal Licence dated 29th June 1902 is on sale at eBay. 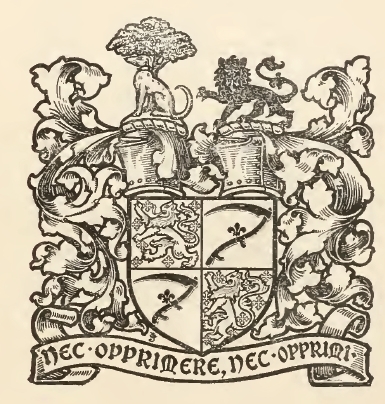 The RL grants Peter Macara of Pentre Byshan Hall, Denbigh, authority to take and use the Surname of Meredith in addition to and after that of Macara and to bear the Arms of Meredith. His wife was the daughter and heiress of Lt Col Henry Warter Meredith. 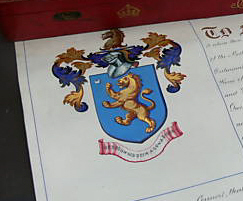 The RL is signed by Sir Albert William Woods (1816 – 1904, Garter Principal King of Arms), George Edward Cokayne (1825 – 1911, Clarenceux King of Arms) and Sir William Henry Weldon (1837 – 1919, Norroy King of Arms). 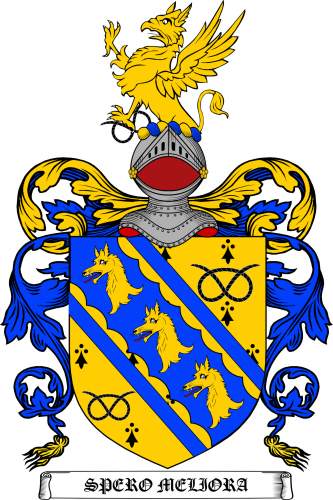 Arm: Azure a lion rampant Or in the dexter chief a crescent Argent. 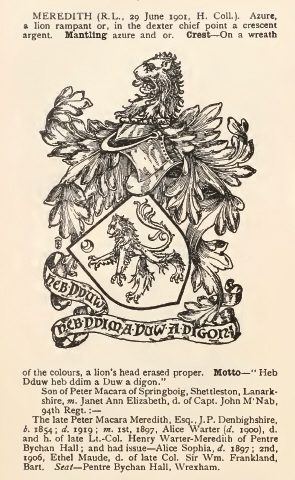 Crest: On a wreath of the colours a lion’s head erased proper. 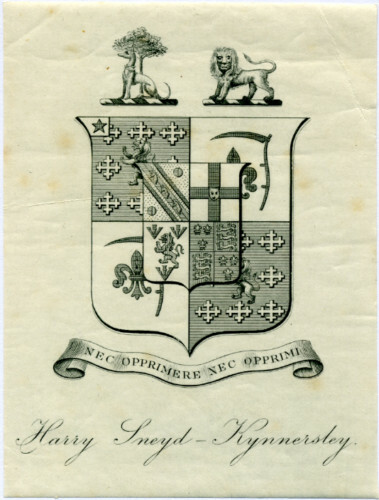 It seems that the late Lt.Col Henry Warter Meredith’s father, Henry Warter, also had a Royal Licence in 1824 to assume the name and arms of Meredith. Arms: Per chevron Sable and Argent in chief a fleece of the last banded and horned Or and in base a lotus flower slipped and leaved proper. 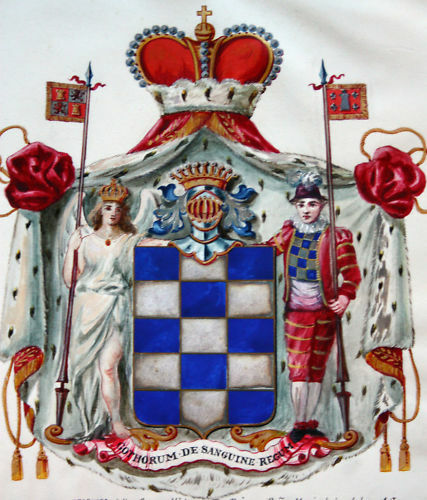 Crest: On a wreath of the colours a representation of the head of Medusa the face Argent crined with snakes Azure. 1897 Entered the Indian Civil Service.